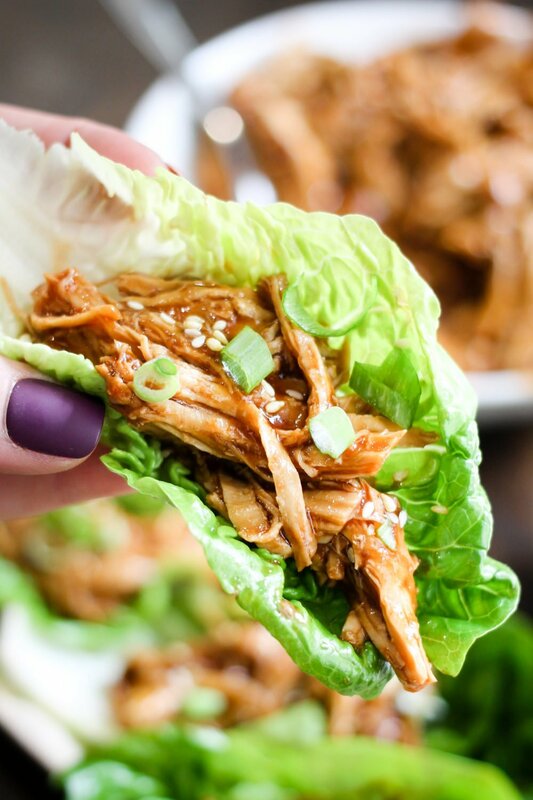 Instant Pot Honey Sesame Chicken Lettuce Wraps are perfect for a delicious and healthy dinner! The sauce is sweet from honey, yet has a tiny kick and is super smooth. 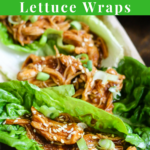 When you load the chicken up in the lettuce wrap and add some green onions you have the perfect flavor and texture punch! 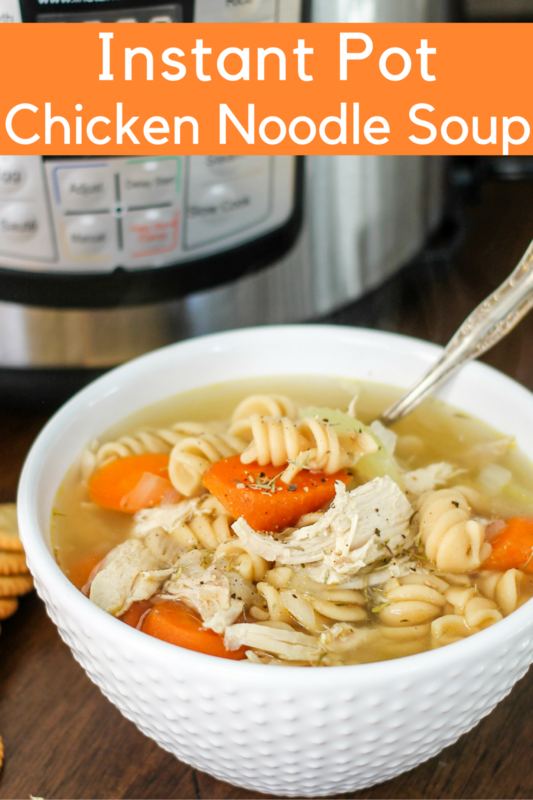 With only 10 minutes to cook up in the Instant Pot, this recipe is a total winner! 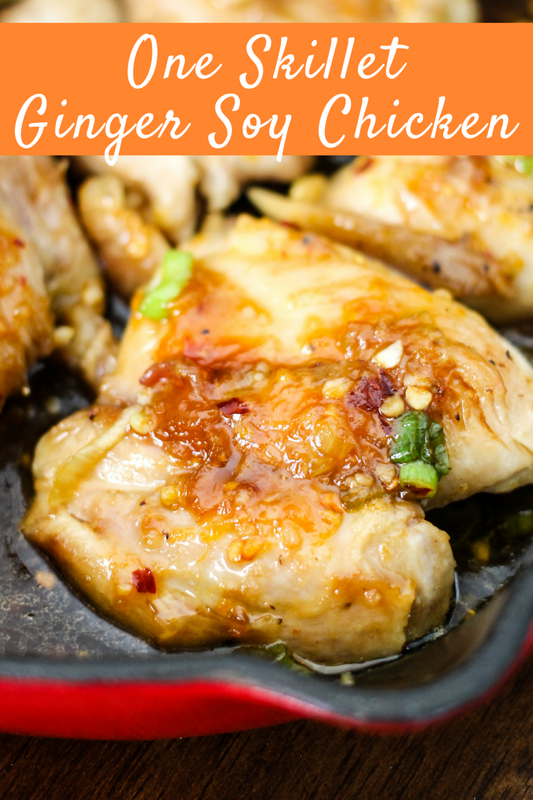 You are going to add your chicken to your Instant Pot, and then whip up the sauce. The sauce is very easy, and it’s likely you have many of the ingredients in the fridge and pantry. The soy sauce, honey, and Sriracha add the most flavor to the sauce. Add your sauce to the instant pot, over the chicken, then cook for 10 minutes. Shred your chicken outside of the instant pot. Thicken your sauce by adding a bit of a cornstarch slurry, and bring to a boil in the IP. Add the chicken back and then stir to coat! You should remember when using the Instant Pot, , that the time it takes to cook the recipe (10 mins), is not the total time of the recipe. You need to give the pot some time to ‘come to pressure’. 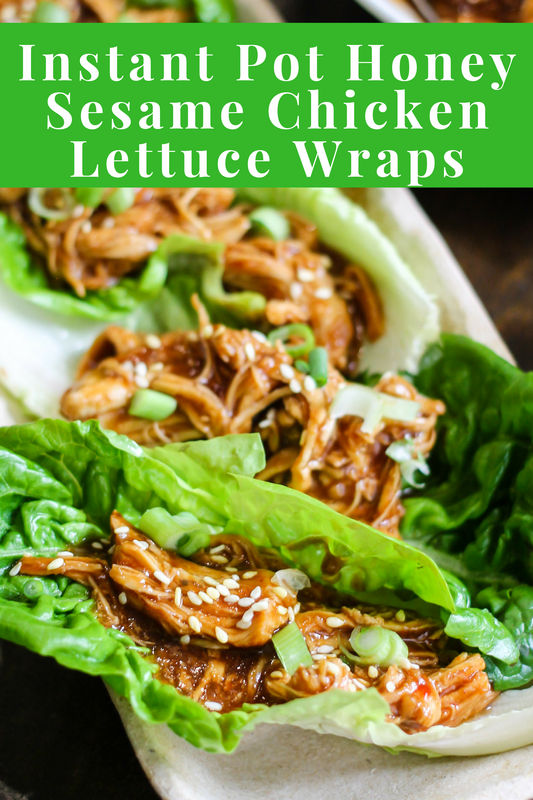 When the Instant Pot Honey Sesame Chicken Lettuce Wraps are finished, I recommend you use the ‘natural release’ to release the pressure which will take about 10 more minutes. If you are in a rush, you can use the quick release, but I suggest you change the cook time to 12 minutes instead of 10 minutes in that case. After you remove and shred the chicken, you will turn the pot to ‘saute’ mode, and let the sauce come to a boil. Add the cornstarch slurry and then cook for 1 more minute. 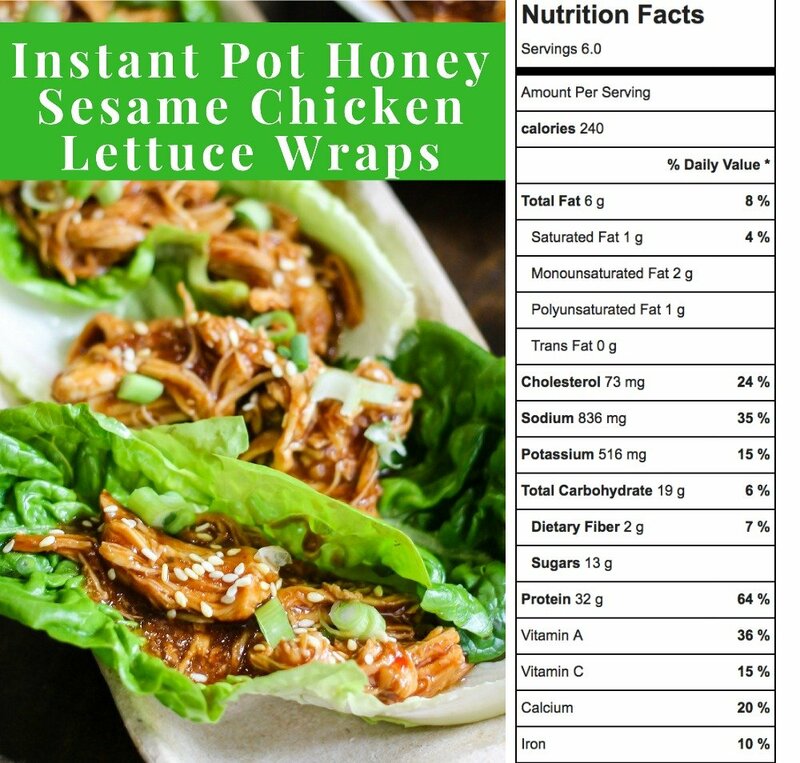 Instant Pot Honey Sesame Chicken Lettuce wraps have only 240 calories per 3 wrap serving, 6 grams of fat, and a whopping 32 grams of protein– WOW! This is a meal you can feel good about feeding your body and family! In the Slow Cooker: Add the chicken and sauce to the slow cooker, cook on high for 6 hours. 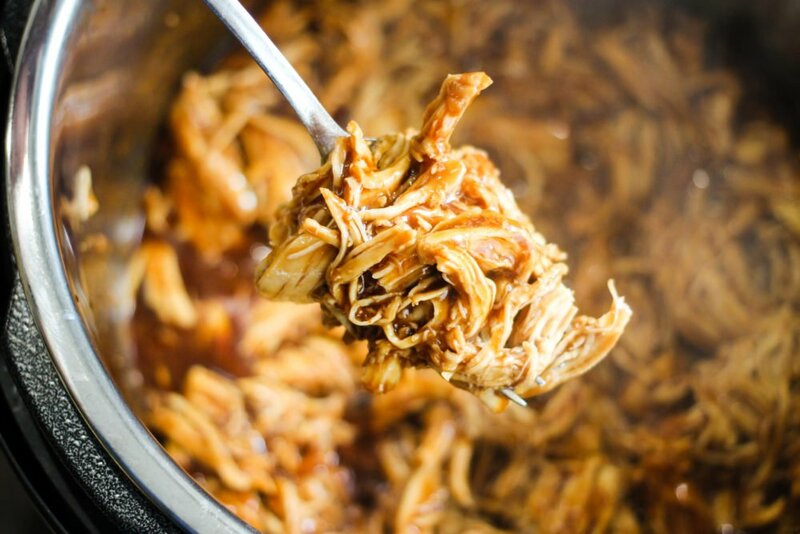 Shred the chicken and add it back to the slow cooker. Add cornstarch slurry, cover, and cook for 30 more minutes. Serve! 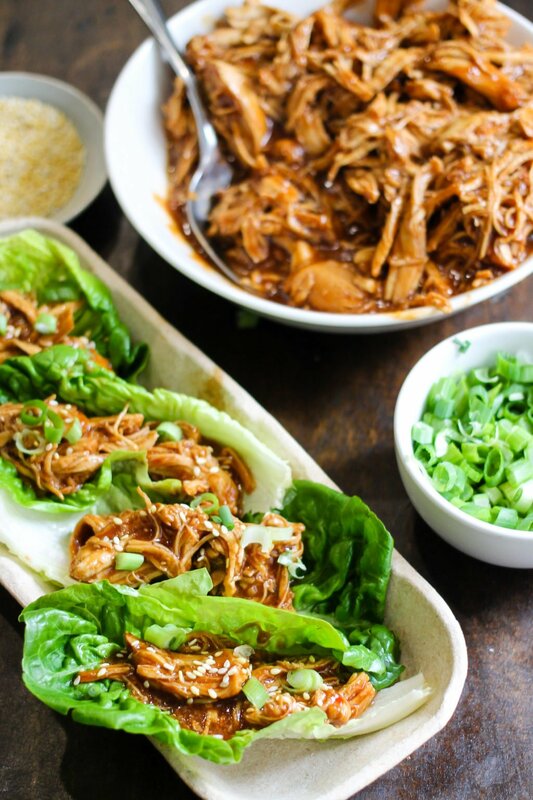 Shredded Pork Lettuce Wraps: Use a 2lb pork loin chopped into 2 inch chunks. Pop them into the Instant Pot, and proceed with step #2 in the directions below. Honey Sesame Chicken Rice Bowls: Serve this delicious Instant Pot Honey Sesame Chicken over rice instead of in lettuce wraps. White or brown rice is fantastic for this! Freeze and cook: In a large freezer ziplock bag, add chicken and sauce, seal the bag, label, and place into freezer. On day of meal, remove the bag and place in the fridge in the morning. Once defrosted dump into the Instant Pot, and follow directions from step #3. I highly recommend the Instant Pot and I am already in love with it! 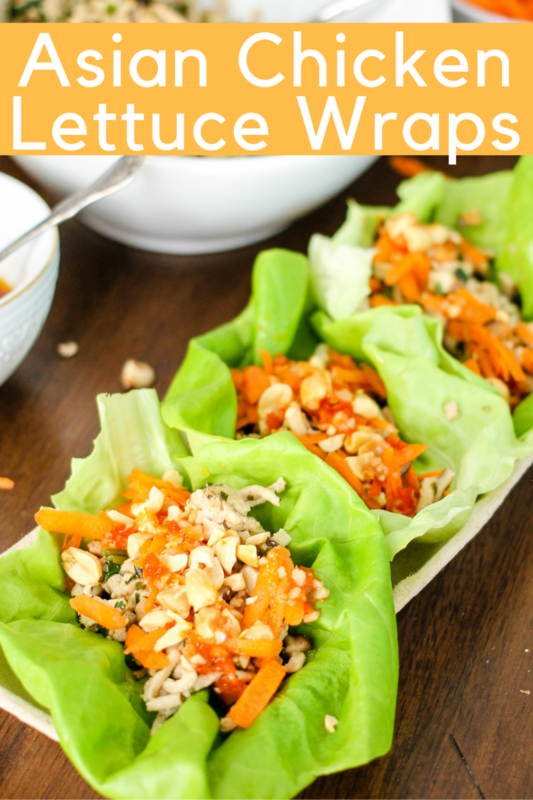 This Instant Honey Sesame Chicken Lettuce Wrap recipe will definitely get you hooked! In a medium bowl, combine soy sauce, honey, tomato paste, rice wine vinegar, garlic, 1/2 cup water, sesame oil, onion powder and Sriracha. Pour over chicken. Seal the IP lid, select 'manual' and adjust time to 10 minutes. When cooking time is up, allow 10 minutes for the Ip to 'natural release' te pressure. After 10 minutes release the remaining pressure. Carefully open the pot top away from your body. Remove chicken, leaving the sauce in the IP. Shred chicken with two forks; set aside. Turn IP to 'saute' mode and bring liquid to boil (should take 3-4 mins). In a small bowl or cup, mix 2 TBS water with cornstarch, then pour into boiling sauce mixture, stir, and cook 1 minute to let thicken. Return shredded chicken to the IP and stir to coat. Turn pot off. Serve chicken in lettuce wraps and top with sesame seeds and chopped green onions. Enjoy! I love that I have everything to make this tonight! You solved my “what’s for dinner?” dilemma! I got an Instant Pot for Christmas and I am just loving it! It is one of my favorite kitchen tools I have gotten in a a long time! Can’t wait to try these recipes! 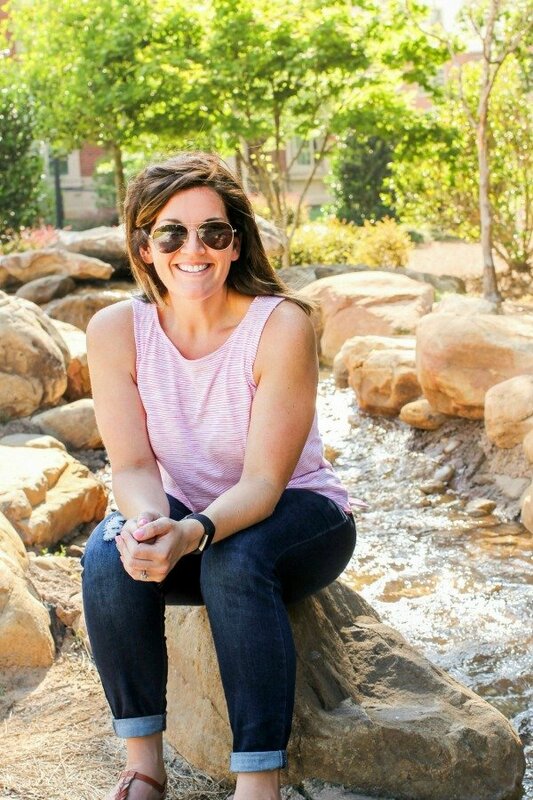 I love everything about this!! It’s easy, healthy and delicious!! Aaand I can make it in my Instant Pot! I love a good healthy lunch or dinner. Perfect to take to work when wanting something light. Perfect for dinner tonight! My family would love this! This looks really good for lunch or dinner! Can’t wait to give this a try! Is the tomato sauce in the recipe a mistake? I followed the recipe and mine turned out red and had an odd taste. No, it’s not a typo. You use a very small amount, 1/4 cup, so it definitely shouldn’t turn out red or taste funny. Maybe you used too much? You could try leaving it out next time if you want. I meant to say the tomato paste not sauce. I think I used to much. I tried it again without the tomato paste and loved it! I am so happy to hear that! I think it adds a little something, but you definitely don’t want to add too much! I am glad you liked it without the paste as well! I’m new to the IP world. Can you tell me the difference if I were to add frozen chicken breasts instead of thawed breasts? Hey Amy – I haven’t made this recipe using frozen breasts, but generally frozen breasts will cook in 12 minutes on manual pressure in the IP. I would suggest letting the pressure release naturally (don’t flip the release) for 5 minutes, then flip the release after that. Then just proceed with the recipe as indicated above. Let me know how it turns out! I don’t see why not. Maybe add 1 extra minute. Is this a recipe I can double? Or is it better to make two times? I am trying it for a dinner party tomorrow and I’m new to using my instant pot! Thank you! Yes absolutely! Same directions/same time! This definitely sounds like a quick good lite meak. And i love thst i could freeze it for lunch baggies. Can’t wait to make this in my new pot. You need to fix your ingredient measurements, that’s definitely not supposed to say 1/4 cup tomato Pate. I watched the video and it looked like you put in 1/4 tablespoon. I messed the recipe up because you put 1/4 cup, which is way too much. Hi Heather- The recipe does call for 1/4 cup tomato paste which is the right measurement. As you can see from all the other comments, people have made this successfully. What you see in the video is the sriracha in such a small amount being put into the sauce. Not sure what happened, but I apologize it didn’t turn out to your liking! It came out fantastic. Loved the sauce! I added 2 teaspoons of black bean paste and used dark soy which adds a rich hint of molasses. I tosasted sliced almonds for the top and added carrot shred. My brother said this was one of my best meals! I’m definitely saving this recipe!